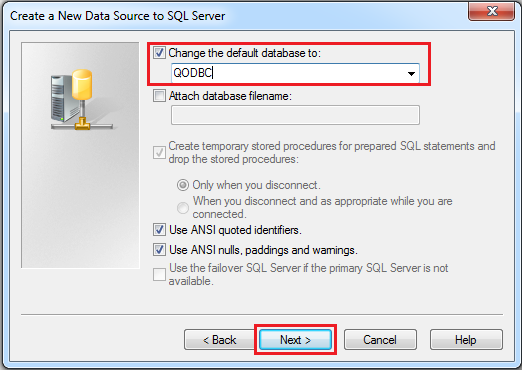 After creating Linked Server, You need to create a new database in SQL Server for creating the stored procedure which accepts SQL query, the stored procedure will call linked server and execute the query. 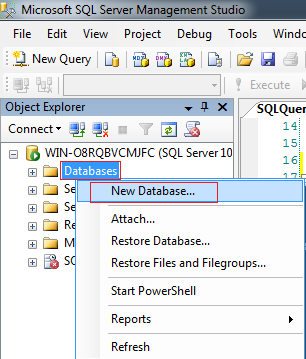 To create a database, You need to right-click on "Database" & click on "New Database". 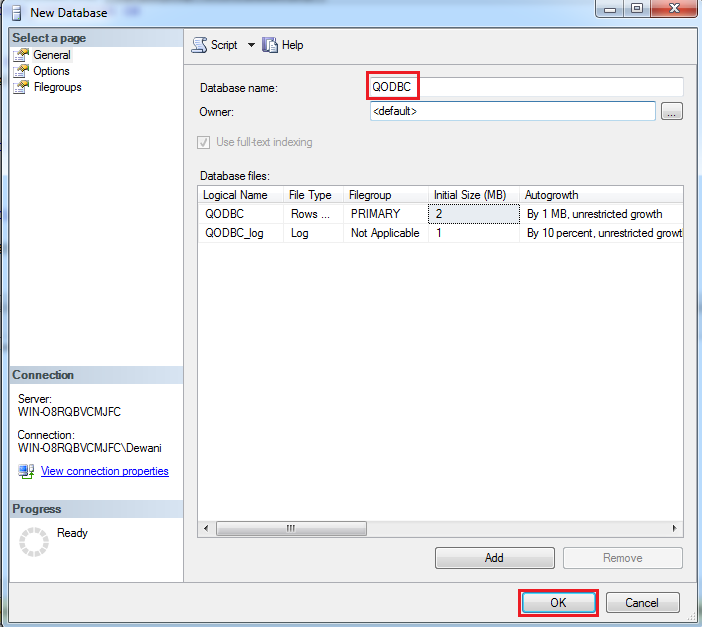 Enter database name & click "OK". 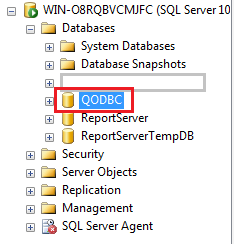 In this example, I am creating database "QODBC". 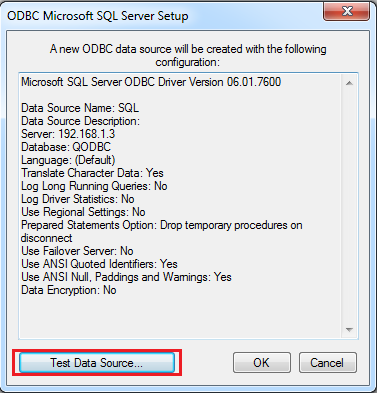 Now, We will create a stored procedure which accepts SQL query, the stored procedure will call linked server and execute the query. 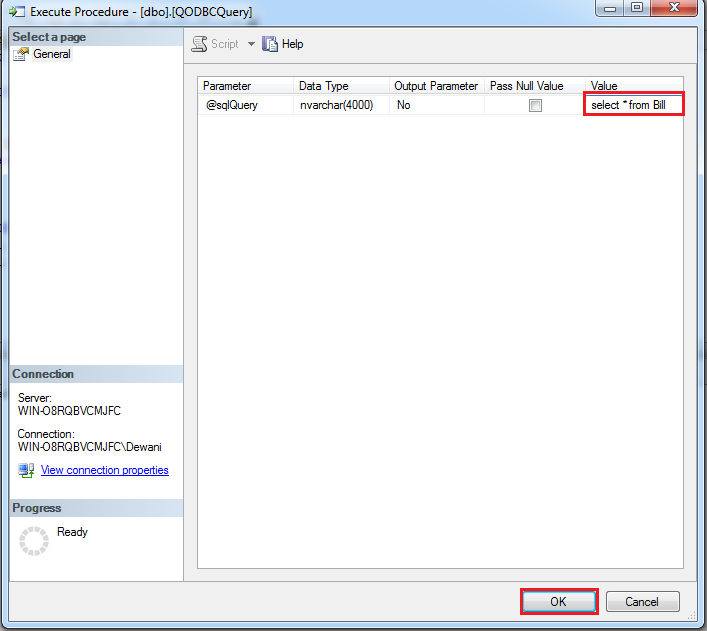 Right-click Stored Procedures, and then click New Stored Procedure. We will create two stored procedure first one will give us a list of all customers & second procedure will accept SQL query through parameter & execute on linked server & provide the query result. 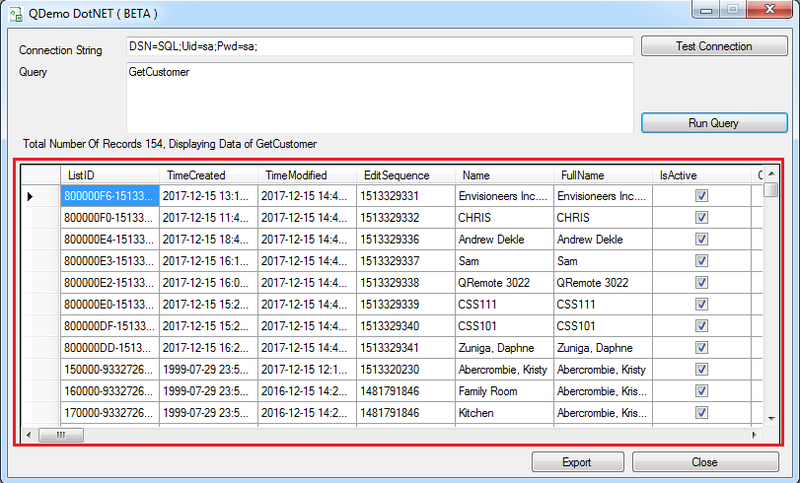 We will create the stored procedure named GetCustomer which will query Customer table through the linked table in SQL Server & provide a list of the customers. Note: The above-stored procedure code is for example. You can change it as per your requirement. By executing this stored procedure we will get a list of the Customers. 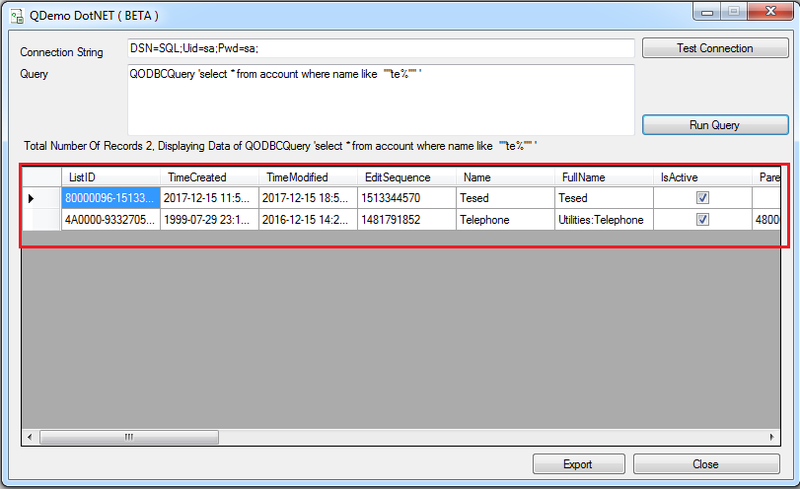 We will create a second stored procedure named QODBCQuery which will accept SQL query through parameter & execute on linked server & provide the query result. Note: The above stored procedure code is for example. You can change it as per your requirement. To execute this stored procedure we need to pass query as the parameter value. 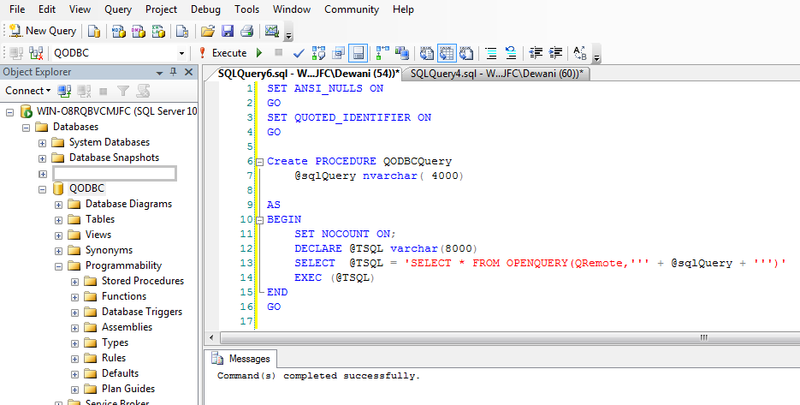 Query result through the stored procedure. 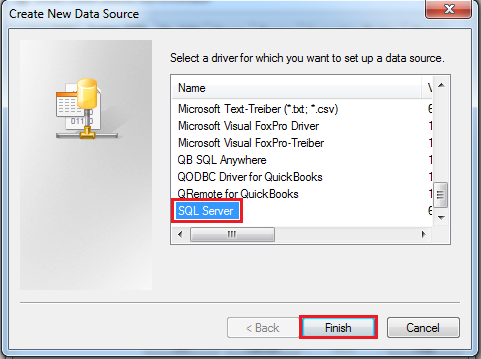 Now, We will create SQL Server DSN on the non-SQL Server machine to access QuickBooks Data remotely via SQL Server. 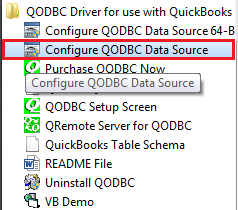 Locate the QODBC Driver for QuickBooks program group on your desktop. 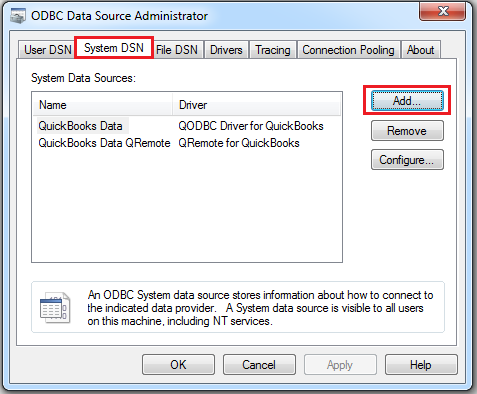 Click on the Configure QODBC Data Source icon to create SQL Server DSN. 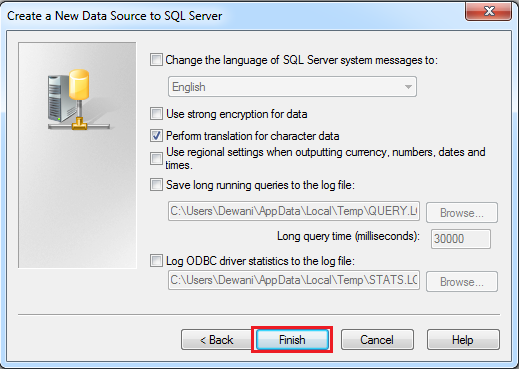 Select SQL Server & click "Finish". 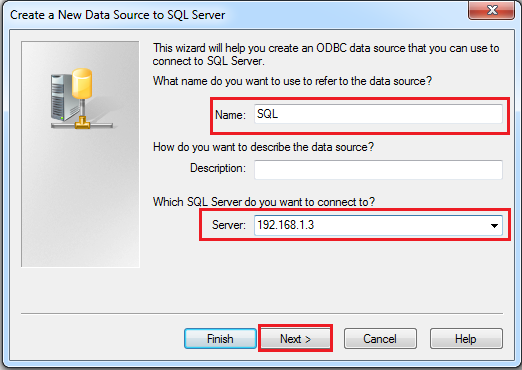 Enter DSN name, SQL Server machine IP address & click "Next". 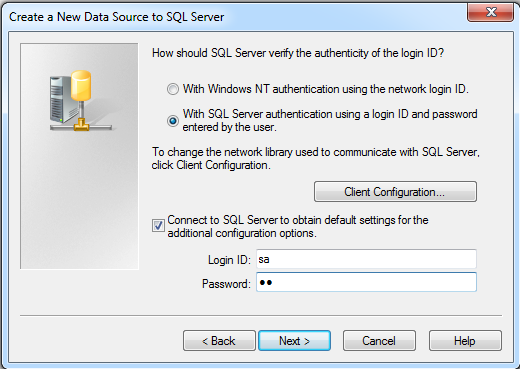 Select authenticity of SQL Server & click "Next". 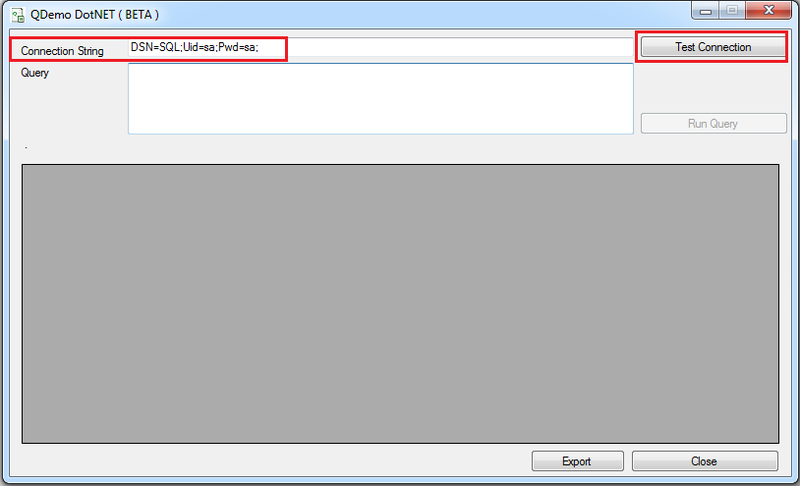 Select SQL Server database in which we have created stored procedure & click "Next". Click on "Test Data Source.." to test the connection. 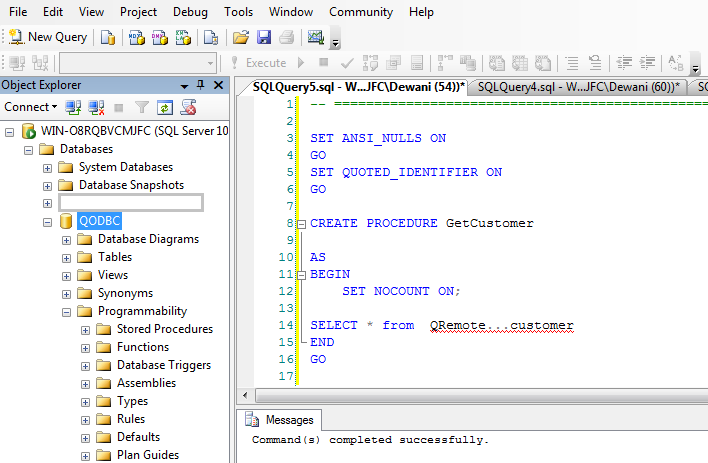 Now we will call this stored procedure from QDemo application. 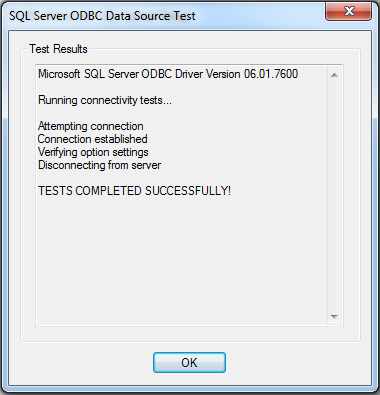 We will use connection string "DSN=SQL;Uid=sa;Pwd=sa;" & click on Test Connection. Note: You need to change DSN Name & User ID & Password as per your configuration. Note: I have used QDemo application for testing purpose only. You can use your application (i.e. MS Access, Excel, VBA etc..) as per your requirement. 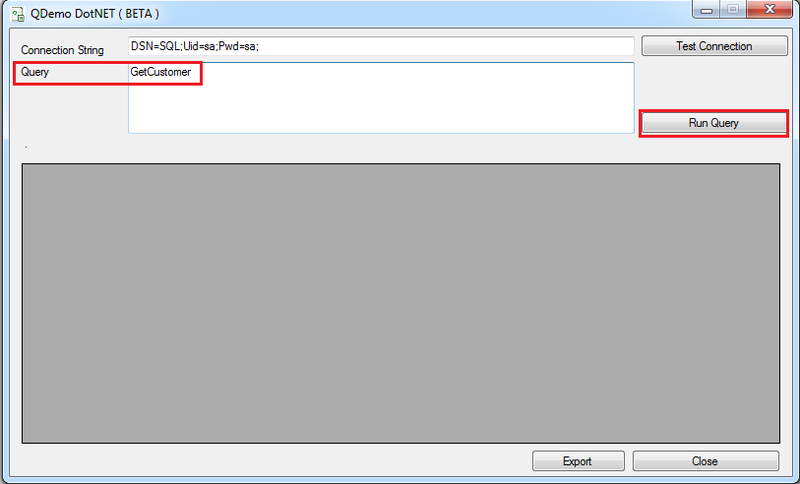 Now we will call stored procedure GetCustomer from QDemo application. Write stored procedure name (i.e. GetCustomer) & click on "Run Query". 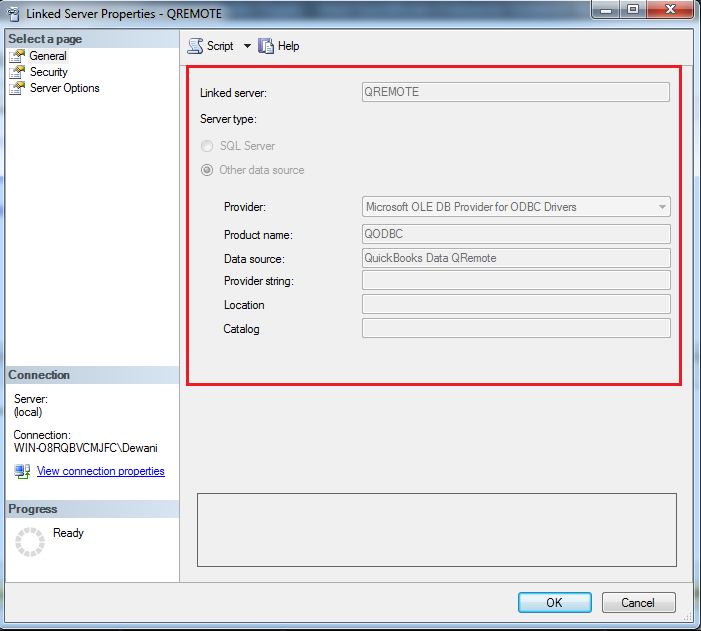 Now we will call second stored procedure QODBCQuery from QDemo application. To execute this stored procedure we need to pass query as the parameter value. 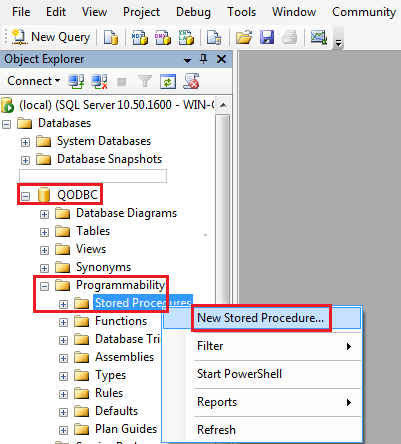 Write stored procedure name & query as parameter(i.e. 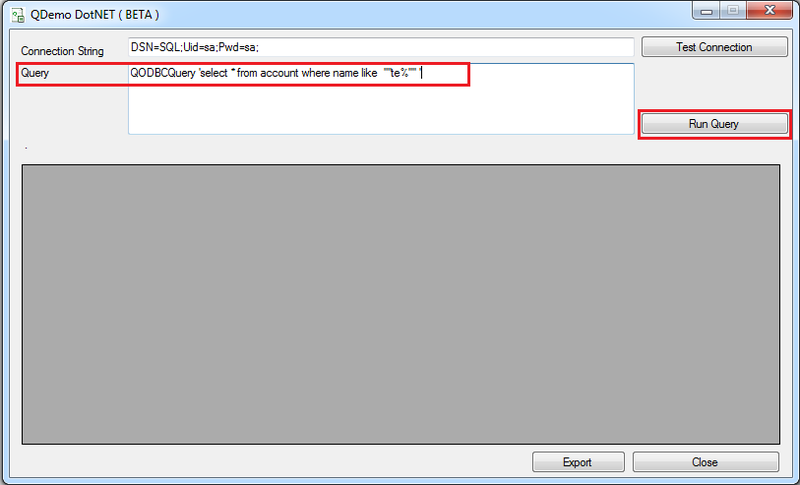 QODBCQuery 'select * from account where name like ''''te%'''' ') & click on "Run Query". Note: You need to pass four single quotes around string value after where condition.